Discussion in 'Trend Spotting' started by Hanne, May 27, 2009. It's everywhere this spring and summer.. and sort of an antidote to the monochrome stud embellished rockerchick chic that is so popular..
..pretty, sweet and exudes summer in the countryside. A.P.C does it.. so does Topshop, Sessun, see by Chloé, Marc by Marc Jacobs ..and needless to say Cacharel ofcourse..
Liberty clair bloomers - and lots of other lingerie items..
Liberty in London and nap among others carries the collection..
Got the most recent J Crew catalogue and there are some in there as well. I love, love, love Liberty prints. They are quintessentially English. I purchased a couple pieces from APC that Hanne posted-- the spaghetti strap dress and pouch. I plan on getting some fabrics from Liberty to make my own skirts and dresses as well. I'm not sure I understand Liberty Prints that much (though I trashed Nikes with liberty prints in the "Shoes, Shoes, Shoes" thread). Are these essentially varied and micro floral details? I don't know this look too much to talk about it to a great degree. The good thing is that I don't have to see every other person hypnotized to skulls and Hot Topic chic all the time. I'm reminded of the '90s with these prints. Looks very childish, yet fun. I only like Liberty prints when they're on something counterintuitive, like a bikini or a blazer. But when they are on something flowy and flowery and whatnot, it just bores me. "Sir Arthur Lazenby Liberty, the founder of Liberty of London, contributed in 1894 to the Healthy and Artistic Dress Union's journal Aglaia, which stated his declared aim to "promote improvements in dress that would make it consistent with health, comfort and healthy appearance, but [dress] should not obviously depart from the conventional mode." Lazenby Liberty had left the Oriental Warehouse, famous among the leading artists and aesthetes of the day for its collections of blue and white porcelain and oriental fabrics in 1874 to set up on his own in half a shop in London's Regent Street. Lazenby Liberty presided over the shop's transformation from an Eastern bazaar to a department store that commissioned and sold modern design of all kinds. "Liberty art fabrics" in subtle tones, which soon became known worldwide as "Liberty colors," (produced in collaboration from 1878 with the dyers and printers of Thomas Wardle) were the first step toward the creation of the shop's new image, and by the end of the century, Stile Liberty was synonymous in Italy with art nouveau. The quintessential fabric of the Aesthetic Movement was Liberty or Art silk and, aided by such popular successes as the Gilbert and Sullivan opera Patience (where the clothes were made from Liberty fabrics and Liberty artistic silks were advertised in the program) and the cartoons of George du Maurier—Liberty soon to became a household name. In 1884 Lazenby Liberty opened the costume department, appointing as its first director the celebrated architect E.W.E. Godwin, whom Oscar Wilde once described as being "the greatest aesthete of us all." Godwin had made a study of historic dress and approached his task with almost missionary zeal, aiming to "establish the of dressmaking fame hygienic, intelligible and progressive basis." Godwin's death three years later did not mean the end of his influence on Liberty dress, and the catalogues showed a wide range of Liberty Art costumes, ranging from a Grecian costume in Arabian cotton, to a peasant dress in thin Umritza cashmere, embroidered and smocked (a skill revived by Liberty and used on the finest materials). Smocking was also a striking feature of the Kate Greenaway-influenced artistic dress for children, a range of clothes hugely popular with Liberty's customers from the late 1880s onwards." im not sure i like them. this clothes instantly take me back to 1994 but i think it has more to do with the fact that i never liked small prints because i dont think they suit my personality..
^ See, I think that's why I love them. I'm very into the 90's right now. 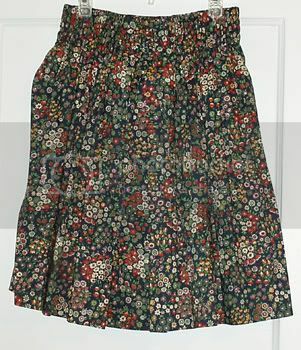 Liberty does larger floral prints as well, but they are not as common. I love the skirt hebden!!! When I lived in London I was at Liberty all the time, I have always loved their prints and fabrics. When I was very young my grandma gave me a jewelry roll from there, and I think that's where it all started. I remember H&M made a series of liberty tops last summer, I got one in purple.. truly lovely, except after a couple of visits to the washing machine, it got too wide and too short. h&m afterall..
Fell in love with this acne dress for summer, not sure if the prints count as liberty but I think they're quite wonderful.